Two RCSB PDB images have been highlighted with 2016 Wellcome Image Awards. David S. Goodsell's painting of Ebola Virus Proteins has been selected as the overall winner, with Maria Voigt's molecular image of Clathrin also recognized with an award. 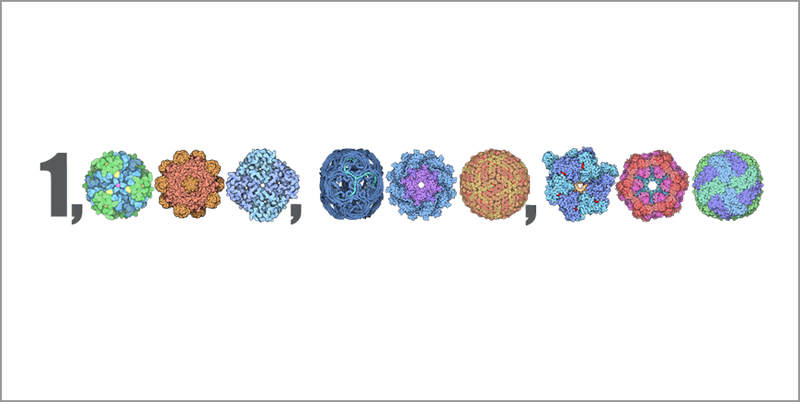 Goodsell's painting was created for his RCSB PDB Molecule of the Month article on Ebola Virus Proteins, and also turned into a related video. This intricate painting shows this tiny, notoriously lethal virus in minute detail, using the structural information available in the Protein Data Bank archive. 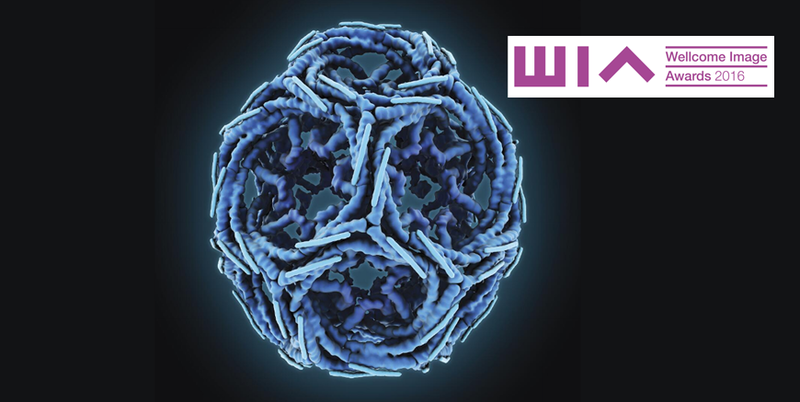 Voigt's Clathrin illustration is part of RCSB PDB's traveling Art of Science exhibit, which uses the context of a community art gallery to introduce new audiences to to the beauty of structural biology. This exhibit is currently on display at the FlexSchool in Fanwood, NJ. These are two of the 20 winning images selected as the best in science image making from all those acquired by the Wellcome Images picture library in the past year. The awards were presented at a ceremony at the Science Museum in London on March 15, where the images are now on show to the public. Other award-winning images include pathways of nerve fiber in the brain, delicate golden scales on a Madagascan sunset moth and a digitally reconstructed skeleton showing atheroma, the "furring up" of arteries that supply blood to the brain which can cause stroke. 16 science centers, museums and galleries will be displaying the winning images in their own styles to spark imaginations everywhere. This year the images will also be appearing as far afield as the Africa Centre for Population Health in South Africa, the Polytechnic Museum in Moscow, Russia, and the Massachusetts Institute of Technology. The images are available to view on the Wellcome Image Awards website along with the stories behind the images and their creators. The images already feature in Wellcome Images collections, where they can be accessed and used along with more than 40,000 other contemporary biomedical and clinical images. The Awards were established in 1997 to reward contributors to the collection for their outstanding work. Ebola Virus Proteins, by David S. Goodsell. 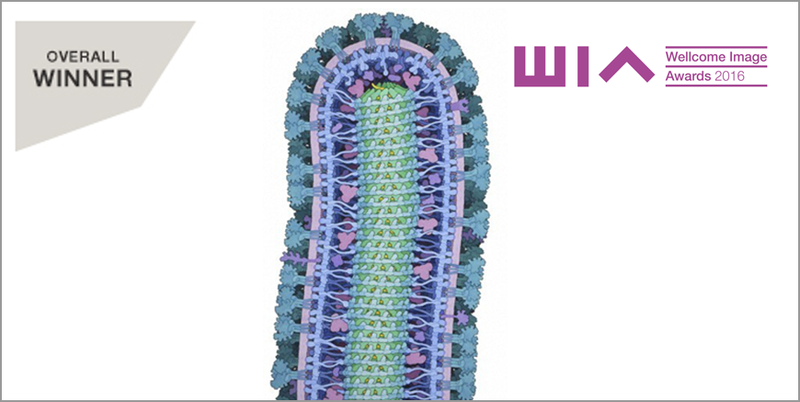 The virus is surrounded by a membrane (pink/purple) stolen from an infected cell. This is studded with proteins from the virus (turquoise) which extend outwards and look like trees rooted in the membrane. These proteins attach to the cells that the virus infects. A layer of proteins (blue) supports the membrane on the inside. Genetic information (RNA; yellow) is stored in a cylinder (nucleocapsid; green) in the centre of the virus. More at Molecule of the Month on Ebola Virus Proteins. Clathrin, by Maria Voigt. Clathrin is a protein found in cells which forms basket- or cage-like structures around small membrane sacs. These clathrin cages help bring molecules into the cell and then carry them around inside from one place to another. They also help sort through the molecules (which can include receptors and nutrients) so that different cargo is efficiently delivered to different destinations. Some disease-causing germs and toxins hijack this process and use it to infect cells. More at Molecule of the Month on Clathrin. Search features at rcsb.org include simple text searching (with autosuggestions), browsing based on common characteristics (experimental method, organism, taxonomy, etc. ), and an option to build complex queries with Advanced Search. Molecular viewers, including JSmol/Jmol, Protein Viewer, and the RCSB PDB's Protein Workshop help users interactively view PDB's atomic structures. Molecule of the Month: Hosted at PDB-101, the educational portal of the RCSB PDB, nearly 200 Molecule of the Month articles describe molecular structure and function with interactive views.